Delicious, affordable, ready in less than ten minutes AND healthy? We ask a lot of our fast food these days, especially those of us who want to keep our waistline and wallets trim while still being able to enjoy dining out. Luckily, the fast-casual food industry is wising up to the increasing health smarts of Atlantans and stepping up to the challenge. Some local chefs have been dishing up healthy affordable eats for years and are even spreading their options across the country. Check out our top 12 ATL picks by clicking through the slideshow. Souper Jenny: In the cold months, it’s hard to turn down a steaming bowl of soup, and this cozy spot with three locations across Atlanta hits the spot. But Jenny Levison, the brains and brawn behind the operation, doesn’t just serve up great soup—the café’s salads and healthy sandwiches are equally awesome. Souper Jenny has different menu offerings every day, with six soups, two sandwiches and two to four salads, but you can always be sure there will be at least one gluten-free, vegetarian and vegan option. Some healthy favorites are the turkey chili, Chinese chicken slaw salad and classic turkey sandwich on thick multigrain bread. And if you want to fill your tank all day, take advantage of their lunch offer: $14 for two menu items, a roll, a piece of fresh fruit, a drink and dessert! Farm to Ladle: This stall in the uber-cool Ponce City Market food hall in one of the city's best neighborhoods is notable for its fresh and healthy menu. The stall serves up breakfast, lunch and dinner seven days a week. We recommend the build-your-own omelet option for breakfast – $9 for up to four fresh veggie toppings. Pick the oatmeal or fruit bowl as your side to be extra virtuous. Their lunch/dinner menu has an array of soups, salads and sandwiches that use fresh, seasonal ingredients. The vegetable medley is a standout (it’s also gluten-free!) and can be topped with grilled chicken or salmon to make a filling, super healthy meal. Yalla! : At Ponce City Market’s counterpart, Inman Park’s Krog Street Market right off the Beltline, health nuts and foodies alike should make a beeline to Yalla! 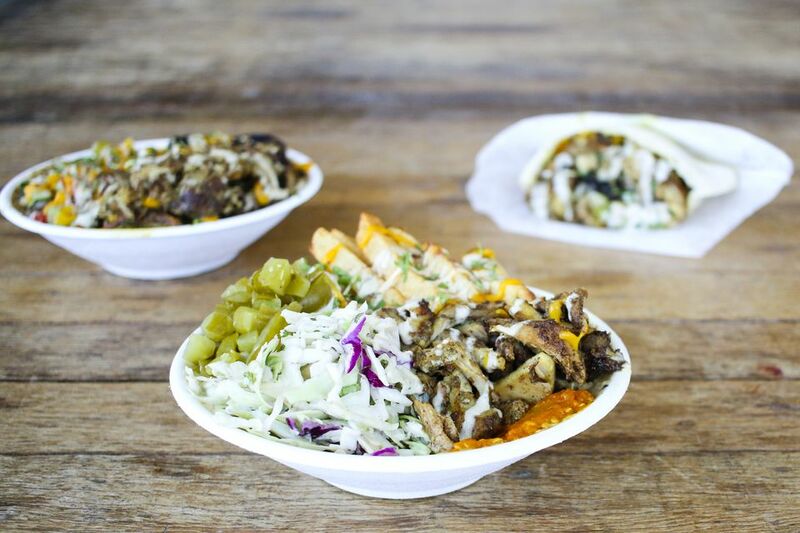 With a bevy of options that can easily be customized to give the diner an incredibly nutritious meal, the modern Middle Eastern stall offers a choice between a pita sandwich, Laffa wrap bread or rice/salad bowl. The healthiest options include chicken shawarma, which is a spit-roasted chicken that comes with hummus, smoked eggplant spread or baba ganoush, and an Israeli salad of cucumbers, tomatoes, parsley and olive oil. The amount of vegetables Yalla! packs into one meal cannot be denied, and the olive oil and tahini used to dress everything are loaded with antioxidants. Gusto! : This fast-casual Atlanta original from Nate Hybl is a star in terms of fast and affordable yet incredibly healthy meals. The restaurant serves up food Chipotle-style in an assembly line that allows for quick service. Diners create a bowl or flatbread with a base, protein choice and a pre-selected “gusto,” or combination of vegetables, garnishes, and sauce. The menu options are simple, but every ingredient is fresh and flavorful, and the gustos, all of which are inspired by international cuisines, meld together perfectly. In the mood for Tex-Mex? Go for the Chipotle Mango Avocado gusto. Or if you’re one of those folks who could dip absolutely anything in hummus, the Tahini Cucumber Feta is the Mediterranean-inspired fix you’ll love. Expect plenty of gluten-free options, too! Urban Pl8: Though the paleo lifestyle is often controversial and misunderstood, Chef Betsy Pitts of Urban Pl8 is a total convert and founded Urban Pl8 to bring healthy, high quality, locally sourced food at affordable prices to Atlantans. But after starting a Crossfit regimen and embracing paleo (which basically means eating the same foods as our ancestors, largely meat and produce, sans grains, dairy and sugar), she made her menu paleo-friendly. Though Urban Pl8 was a food delivery service for a good number of years, it is finally getting a brick and mortar location at Krog Street Market (across from Yalla!). And it isn’t just paleo devotees who can enjoy the delicious, healthy offerings: Urban Pl8’s daily specials like Asian Beef Salas, Grilled Chicken Tagine and the weekend brunch special of Paleo hash would be devoured by any modern human. Naanstop: Naanstop’s tagline is “Fast. Fresh. Indian.” and those three words really do sum up this awesome spot across from the Atlanta Tech Village in Buckhead. Naanstop’s owners were inspired by their mom’s home cooking to provide the same quality of traditional Indian food to diners in an affordable and convenient way. They braise their lamb curry for four hours and roll out their naan (an Indian bread—think a cross between a flatbread and a pita) by hand. They also are committed to using only high-quality ingredients—the chicken is hormone and antibiotic free, for example. They have several vegetarian and vegan options, and every entrée is gluten-free when in a rice bowl or salad. Bonus points if you opt for one of their plant-based proteins, like lentils or garbanzo beans. Naanstop’s different chutney sauce options, like the “Cool” yogurt and cilantro to the hotter chili sauce, pack a ton of flavor without major calories. Bell Street Burritos: Putting Chipotle to shame, once again, Atlanta original Bell Street Burritos has the distinction of having been named one of the ten greatest burritos in America by USA Today. In addition to serving up a genuinely great burrito, burrito bowl, or taco, Bell Street also has one of the most veg-friendly menus of any of the city’s many casual Mexican joints. One of their specialty burritos, the Chicken and Broccoli, packs the tortilla full of this great-for-you cruciferous vegetable. Grilled onions, spinach, and potatoes are some of the other healthy add-ins or main staples of a Bell Street dish. Want to make your meal even healthier? Ditch the tortilla and build a veggie and bean bowl for a fiber and protein packed lunch. Qing Mu: This noodle shop in the brand new Buckhead Atlanta development is deceiving—the exotic décor and swanky neighbors might trick passerby into thinking it has high prices, but the average noodle bowl is less than $10 (and the portions are huge!). Qing Mu’s mission is to bring Chinese food “back to its traditional roots with only the healthiest and freshest ingredients.” Craft a soup bowl “Your Way” by choosing from a range of proteins, from hormone-free, free-range meat to organic tofu and vegetable add-ins. Diners can choose a level of spiciness, from mild to hot, and even the broth can be customized for vegans. Those new to the healthy eating world will also appreciate the menu at Qing Mu, which lists the specific health properties of each ingredient. For example, did you know bamboo shoots reduce inflammation and lower cholesterol? Or that bok choy burns body fat? This is a must-try for the Atlantan who wants to know exactly how the food she’s eating is helping her body. Fresh to Order: Also known as F20, this restaurant bills itself as fine-casual, with the mindset that high-quality, healthy and tasty food shouldn’t cost a fortune. Originally only in Atlanta, F20 has expanded with locations in Florida, Tennessee, South Carolina and North Carolina, a testament to its major fan base. From the monster-sized salads to the flavorful entrees, there’s really not much on the menu that isn’t a healthy option (with the exception of the decadent dessert pies or brownies). Some particularly healthy standouts include the Spinach Salad, packed with superfoods like fresh strawberries, almonds and cranberries and the unique coconut curry salmon. Zoe’s Kitchen: If it seems like there’s a lot of Mediterranean-inspired options on this list, it’s because this cuisine truly is one of the healthiest in the world. The Mediterranean diet, focused on vegetables, healthy fats from fish and olive oil, and lean protein sources, has been proven to promote healthy aging and a long life. And no fast-casual restaurant emphasizes this more than Zoe’s Kitchen. It would be hard to list the many ways Zoe’s makes every meal option healthy: grains like protein-rich quinoa replace less nutritious white rice, every lean meat is grilled in heart-healthy olive oil, and food is flavored with low-calorie, high-flavor spices, herbs, and lemon. With multiple locations around Atlanta, Zoe’s is worth multiple visits. This instantly 'grammable spot on the Westside specializes in organic bowls, smoothies and toasts. Feeling indecisive? Choose from one of the pre-made grain or green bowls-—the Aloha Bowl with bamboo rice, mango, fresh jalapeños, scallions, avocado, toasted macadamia and housemade ginger miso dressing with fair trade, wild-caught tuna poke is always a solid choice. Or build your own choosing from a rice and/or greens base, proteins ranging from agave sriracha tofu to grilled chicken, fresh fruits and vegetables and over a dozen dressings like cashew lime and curry coconut. Portions are generous, so odds are you'll have enough leftover for another meal (and to ease the blow of a $15 salad!). Sweet and savory yogurt and smoothie bowls and a variety of breakfast toasts round out the menu. Don't sleep on the beverages, which range from hot or cold superfood lattes like matcha and golden milk to house-made lemonades like turmeric and charcoal. You can't help but to "choose happy" in this brightly colored outpost of the national chain that serves up good vibes and even better fare. From avocado hummus starters to veggie-packed salads, grain bowls and wraps, the entire menu is vegan, paleo and gluten-free friendly and sourced from scratch. You can easily make a meal of the three for $10 "plates," which feature sides like red chili glazed sweet potato with bok choy and sesame seed and roasted butternut squash with black kale, toasted mulberry and maple chestnut vinaigrette.